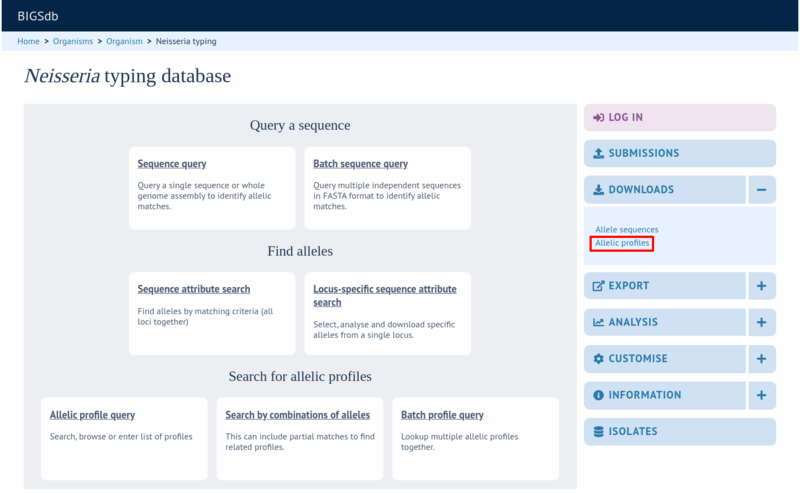 The sequence definition database defines alleles, i.e. links an allele identifier to a sequence. It also defines scheme, e.g. MLST, profiles. 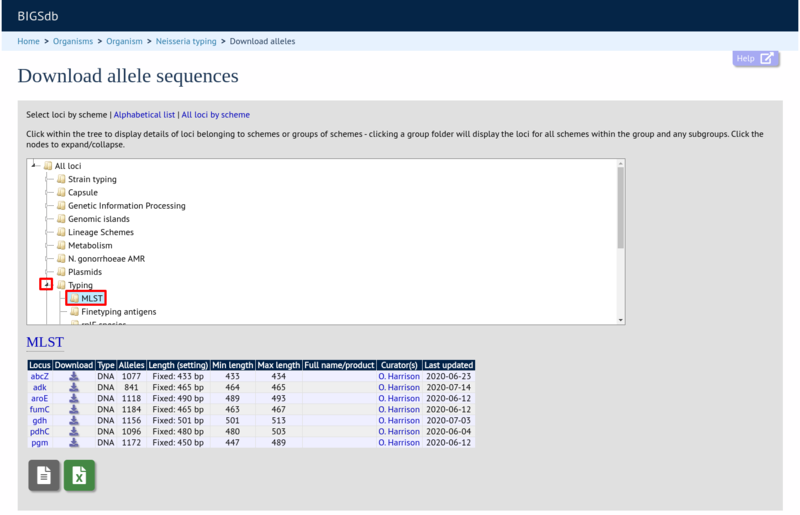 Click the ‘Allele sequences’ link in the ‘Downloads’ section. Depending on the database, you may see either a hierarchical scheme tree or a table of loci. You can choose to display links either by scheme using the scheme tree, as an alphabetical list or a page of all schemes, by selecting the approrpiate link at the top of the page. You can drill down through the tree by clicking branch nodes. Clicking the labels of internal nodes will display tables of all schemes belonging to that scheme group. Clicking the labels of terminal nodes will display that single scheme table. Alleles will be downloaded in FASTA format, e.g. Loci can be displayed in an alphabetical list. Loci will be grouped in to tables by initial letter. If common names are set for loci, they will be listed by both primary and common names. Click the download links for the required locus. Loci can also be displayed by scheme with all schemes displayed. Click the green download links for the required locus. The locus table can be downloaded in tab-delimited text or Excel formats by clicking the links following table display. Scheme profiles, e.g. those for MLST, can be downloaded by clicking the appropriate link on the contents page. Profiles will be downloaded in tab-delimited format, e.g. © Copyright 2014-2019, Keith Jolley Revision 278e9ea7.